Webcasting Epnet » Conference Videographer South Africa Event Filming Company Live Streaming. Filming a conference can be done in many ways using a Smartphone, home camera or by employing a videographer and production team who are able to film your conference in full HD 1080I quality. Our company has specialized in the filming of conferences in South Africa and last year alone completed over thirty five of them. Our difference is that we bring our portable mobile studio. So we don’t just bring our video cameras but we do the whole editing work at the same time as recording the video. 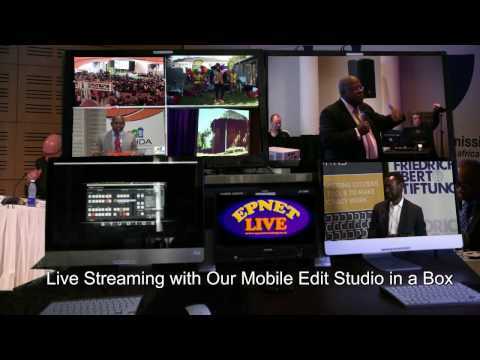 With the Epnet mobile video studio that enables live production and event recording ideal for up to 4 cameras. Our experienced team can film your conference or event, vision-mix it and record it live. This means they can hand over the completed video as soon as the event is over, in whatever format you fancy. Our HD/SD mobile switcher supports full 1080i video and is designed for recording video of live events and conferences, which may require a wide variety of cameras and audio sources. So you can be sure that you get the best quality coverage of your event in the quickest time. Catch all the moments at your next conference. Whether you require single camera coverage of your event, or a multi-camera set-up with vision mixing, we can supply the right equipment with highly experienced, flexible pro-active crew. Who Needs Multi Camera Streaming & Recording? There are a variety of different industries that benefit from the ability to record and stream multi-camera productions. Provide online learning for students, stream your lectures, automate your lecture capture. Stream your teams games. Record special events and broadcast to the community. Stream your events to those who cannot attend. Use recordings for virtual events or to market future events. Stream your worship services, bible studies, offsite events. Broadcast to satellite locations. Stream live concerts, create HD videos, allow users to see multiple views. Stream official meetings, record and broadcast campaign events, reach more people.